The Grand Hall serves as the main temple hall where the statue of Sakyamuni Buddha, whose teachings founded Buddhism, is worshiped. The Grand Hall is also known as the Grand Hall of Great Sage or Mahavira Hall. 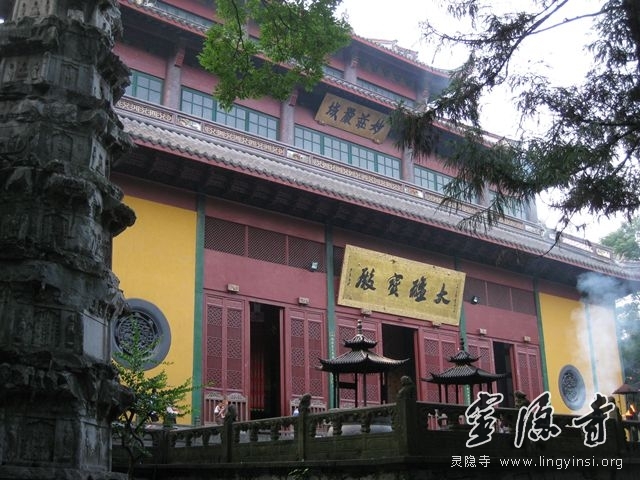 Lingyin Temple’s Grand Hall is located behind the Hall of Heavenly Kings and is the second hall of the Monastery. The structure is 33.6 meters in height, built on an area of 1,200 square meters--seven traditional sections wide, four sections deep. The appearance of the Grand Hall is intentionally impressive in size to reflect its majestic symbolism. Primarily a Qing Dynasty architectural design, which imitated the style of Tang Dynasty, the current Grand Hall is a traditional one-story, three-floored building (a single roof and two extended eves). Chinese classic detailing techniques are prominent with red and green color as the main tone; a lively portrayal of “two dragons playing with a pearl” on the ridge of the roof protruding at a steep angle so that the whole building seems both tall, nimble and lively. Extensive decorative work can still be seen throughout the structure: tiles, window frames, beams,highrelief. In the center of the hall is a lotus platform on which the statue of Buddha in sitting posture is placed, namely Sakyamuni. The statue is 24.8 meters in height, the distance from the stone lotus seat to backlight roof is 19.6 meters, and the height of Buddha is 9.1 meters with 1.3 meters long ears. The structure of the statue consists of 24 pieces of carved camphor wood, which is China's largest camphor wood statue, and is also the second tallest Buddhist statue in Chinese temples. The entire statue of Buddha is carefully designed, with the head leaning slightly forward and eyes at a slight gaze conveying solemn kindness; the left hand transverses the body and rests on the foot with the other hand’s fingers up in the gesture of “mudra of teaching.” Professor Deng Bai from the East Branch of China Central Academy of Fine Arts (now Academy of Fine Arts of Zhejiang) design and crafted the grand statue along with folk artists of eastern China in rebuilding project of 1953. Because this plan was examined and approved by Premier Zhou Enlai, the government allocated twice the funds and the gold for remodeling the statue of Buddha. On both sides of the Grand hall are the standing statues of “the twenty heavenly Protectors” who carry Buddhist instruments as well as weapons, the expressions and gestures of them are vividly captured in these figures. Behind the Grand hall, there are a total of twelve sitting statues, “the twelve enlightenment.” There are six statues on the east side: Manjusri Bodhisattva, Puyan Bodhisattva, Xianshou Bodhisattva, Guangyin Bodhisattva, Mile Bodhisattva, and Jingyin Bodahisattva. There are another six statues on the west side, they are Puxian Bodhisattva, Miaojue Bodhisattva, Shanhui Bodhisattva, Shanjian Bodhisattva, Jingangzang Bodhisattva and Weiyin Bodhisattva. The layout of “the twelve enlightenment” statue of Buddha setted in the main hall can only be found in the Ling Yin Temple. On the posterior wall of the statue of Sakyamuni Buddha is the island stereoscopic group statue of “Devout Boy’s Fifty-Three Pilgrimage” with the theme of "the boys worshipping the GuanYin Bodhisattva (Avalokitesvara) Bodhisattava. The cluster of the sculptures is 20 meters high in total with more than 150 statues on the island, all formed with clay. The expressions and gestures of the statues are vividly captured in the Buddhist Art style. This group of statues on the rock wall represents the classical allusion of “Fifty-Three Pilgrimage,” the devout boy traveled southward and visited fifty-three famous masters before he cultivated himself, which is recorded in the “Huayan Sutras” of Buddha. The overall layout of the group of sculptures is divided into 3 layers, they are heaven, earth and sea. The top sculpture of an emaciated, dried-up appearance depicting Sakyamuni’s bitter hardships of cultivation on the snowy mountain before he became Buddha. The gold sculpture in the middle sits Earth Store Ksitigarbha bodhisattva, and in center bottom, the feature sculpture of Guan Yin Buddhisattva(Avalokitesvara) atop the mythological sea turtle and carry the pure water bottle. On the right side of the Guan Yin Avalokitesvara Buddhisattva is a boy statue, namely Sudhana, wearing red underwear and crossing his fingers. Also featured is the eighteen Arhats who on the South SeaPilgrimage. The plaque hanging outside the Great Hall which stands for “Wonderful and Solemn Domain” is written by Zhang Zongxiang, former chief librarian of Zhejiang library. Another plague “the Great Buddha’s Hall” was drafted in 1978 by Sha Meng Hai, a calligrapher and director of Xi Leng Seal (stamp carving) Club. The Temple that stands today is a composite that saw several repair projects since. The Great Hall began constructed in 1910 by an businessman (and official) from Jiansu, Sheng Xuanhuai, who contributed a huge amount of money to the construction. The main material used in the construction was the American redwood pine. This batch of redwood pine was originally used to build a navy warship by Li Hong Zhang, but in the later period, part of the redwood pine was used to build the Summer Palace in Beijing by the Empress Dowager CiXi, and another portion of the redwood pines was transported southward to the Gong Chen bridge’s wharf in Hangzhou for building the halls of the Ling Yin Temple.